Earlier, I wrote about how the CNT/HUD Housing + Transportation Affordability index (HTA), while a very worthy addition to discussions around whether households can affordably live in suburban vs. urban areas, has a denominator problem at metropolitan boundaries, or even within metros which have severe income inequality. Yet LocationAffordability also has a numerator problem: For housing costs, it relies upon another Census data point which has One Weird Quirk. 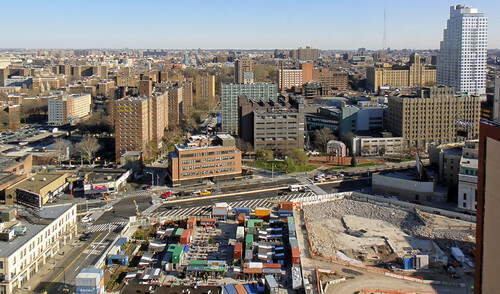 The tract on the left (in downtown Brooklyn) is public housing, with a reported median monthly rent of $768; the tract on the right $2,467. But for someone just moving to town, the only vacancies are in that fancy new building. [B]y looking at average rents, which in some cities include many rent-stabilized units, the calculation doesn’t necessarily capture what someone searching for shelter is likely to pay. If you’re trying to find an apartment in New York now, getting a place for the average rent would probably be extremely difficult. Unlike the denominator problem, which shows up at a macro level, this discrepancy only really shows up at the micro level. I just noticed it in the recent “WalkUP equity ranking” from GW’s CREUA, which (based on HTA) found suspiciously low rents reported in some very upscale neighborhoods. I suspect the typical rents found are those paid by a small number of long-term residents in subsidized or rent-controlled units (set years ago), rather than those paid by the residents of the new luxury apartments. HUD’s new Small Area Fair Market Rents are reported down to the ZIP code level (and have the big problem of not being available everywhere), which is a much larger level of analysis than Census tract, but they’re an attempt at figuring out a systematic answer to this problem. So basically, what you’re saying is that in just about any metropolitan market, available apartment rent is always going to be at or near the upper end of the rent distribution? Not necessarily; rising housing prices aren’t a given, especially in rental markets. In a normal supply situation, the gap wouldn’t be that large, either; it’s only in extraordinary supply situations (like under rent control, which is rare in the USA) that a noticeably large difference would open up.